This pasteurized cow’s milk mountain cheese is made from the milk of Montbeliard, Abondance and Villard cows. Penicillium roqueforti has been added and the cheese is aged for several months in controlled conditions. Originally made by monks, this cheese has a sweet, soft, consistent taste. It pairs well with sauternes and late harvest wines. This cheese has AOC-certification. This raw-milk mountain cheese is produced in the Haute-Savoie region of France using a blend of milk from the Abondance, Montbeliard and Tarine breeds of cows. This semi-hard cheese has a strong smell and a complex, but balanced flavor. It has a slight sweetness to it. Abondance is made in wheels that usually weigh about 20 pounds. It is aged for at least 90 days in a temperature and humidity-controlled cellar. The surface is rubbed with coarse salt and wiped with brine on alternating days during the aging process. Abondance is an AOC-certified cheese. One of the ways the people in the region enjoy Abondance cheese is in the melted cheese and potato dish, Berthoud. This mountain cheese is produced in the Savoie region of France using raw milk from the cows of the Beaufort area – the Tarines or the Tarentaises. Both Summer Beaufort and Winter Beaufort cheeses are made. In the summertime, the cows are led to graze up in the montains on the alpine grasses, herbs and flowers. In the wintertime, the cows have to stay in the barn to protect them from the heavy snows of the region. In my opinion, the Summer Beaufort is the most flavorful, the flavor of the herbs and the grasses from the region come through in the cheese. The Summer Beaufort is also more colorful – a pale yellow compared to the Winter cheese, which is white. This cheese ages for at least four months under strict aging conditions, during which the cheese is constantly rubbed with brine. This cheese can also be left to age much longer and will develop a more complex flavor and strong aroma. This cheese is AOC-certified. The locals use this cheese in many dishes, including fondue and raclette. This cheese is produced in several regions of France, including parts of the French Alps. I tasted an Emmental that was made near Beaufort in the Savoie region. Emmental is normally made with pasteurized cow’s milk. This cheese is aged for several weeks, alternating among 55 degrees F, 70 degrees F and 64 degrees F conditions. The finished product resembles a Swiss cheese with holes. This cheese is great in fondue. 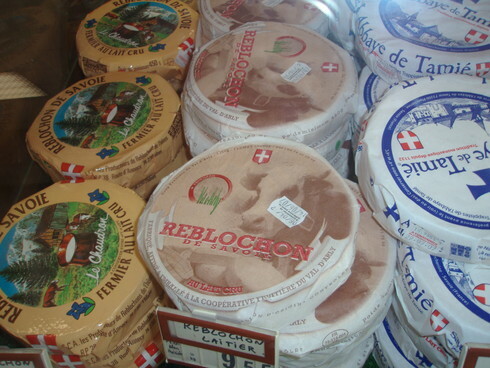 Reblochon is a fresh, youthful cheese from the Savoie Region. It is made from raw milk from the second (richer milk) milking of the Abondance, Montbeliard and Tarine cows. Affinage is normally from three to four weeks, and the resulting product is moist and smooth. (Note, however, that since Reblochon is made from raw milk, the Reblochon that is sold in the U.S. must be aged a minimum of 60 days to allow any harmful bacteria to die.) This is an AOC-certified cheese. The locals enjoy Reblochon cheese in a delicious, hardy cheese-potato-bacon dish called Tartiflette. I also really enjoyed the local specialty, Reblochonade, as well. This cheese is normally made on a small farm in the Savoie region using cow’s milk. Tommes are generally small rounds of cheeses that are made when there is not enough milk to make a large cheese, such as Beaufort. Butter is normally made with the cream and cheeses are made from the remaining skimmed milk, although some whole-milk Tommes are made, too. These small rounds of cheese are allowed to age for at least four weeks. Small holes generally form on the rind and inside the cheese. The cheese is commonly semi-hard and mild in flavor.